The city of Mantua claimed Virgil as its Roman forebear (Isabella d’Este struggled without success to realize a monument to the poet there). Ferrara recognized Plautus as a native son. As far as we know, the first time a work of classical theater was performed after the end of antiquity was on January 25, 1486, in Ferrara. The occasion was the visit of Francesco Gonzaga before his marriage to Isabella. The play, part of a long and lavish series of entertainments, was Plautus’s Menaechmi. The Roman playwright’s broad comedies were a good fit for the Ferrarese court, which was inclined toward the “theatrical” more than was the case elsewhere. Ferrara had a taste for risqué humor and the delights of the senses. A love of various pleasures can be gauged by the names of Este estates: Belriguardo, Belfiore, and Schifanoia—“beautiful view,” “beautiful flower,” and “escape from annoyance.” The court was aristocratic to a mannered degree. Fascinated with novelty and ciphers, it was more taken with stylization than naturalism. During the successive reigns of three half-brothers, Lionello, Borso, and Ercole d’Este, Ferrara emerged as an important center for all the arts. The court became a conduit for French musical trends to reach Italy. Ferrarese poet Matteo Maria Boiardo penned the chivalrous romance Orlando Innamorato, published posthumously in 1495. His incomplete tale of a knight in service to Charlemagne was taken up by Ariosto in Orlando Furioso, which remained an inspiration for artists and musicians for centuries. It was first published in Ferrara in 1516 while Ariosto was in service to Ercole’s son Alfonso (discussed later). Boiardo and Ariosto were accomplished as diplomats and courtiers. The Ferrarese court prized wit and erudition. Cosmè’s complicated subjects appealed to such an audience attuned to artifice. By 1452 he was receiving a regular salary from Borso d’Este, and he continued to serve as court artist until the mid 1480s. This picture is layered with meaning. From the Annunciation in the roundels to the infant’s sleep that presages his death, the entire history of Christian salvation is communicated in this one small panel. The gilding, brilliant color, and Cosmè’s mannered style also satisfied courtly tastes. Pisanello made several portrait medals for the marquis of Ferrara. This one commemorated Lionello’s marriage to Maria of Aragon in 1444. It was his second marriage, and she was Alfonso’s illegitimate daughter. Nevertheless, the match greatly enhanced Lionello’s status, as the inscription, which identifies him as the “son-in-law of the king of Aragon,” suggests. On the medal’s reverse Lionello appears in the guise of a lion, a pun on his name. 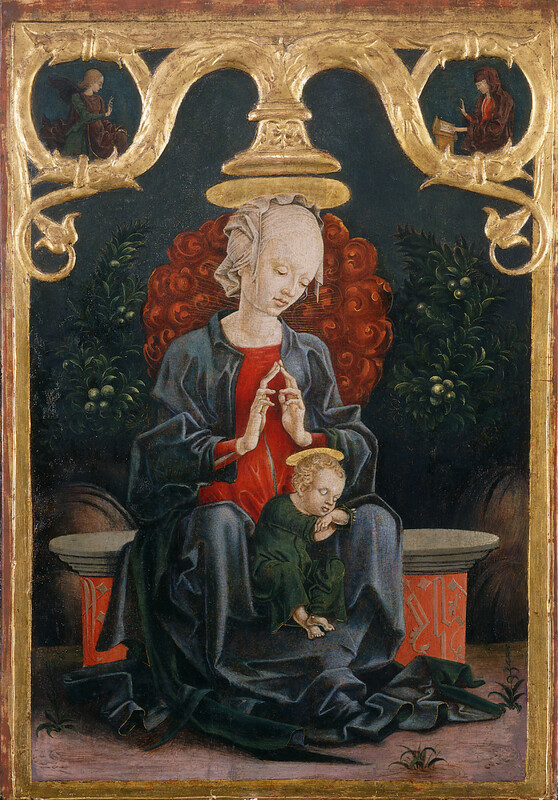 With a scholarly and intellectual bent, Lionello promoted a conception of the patron as art expert and connoisseur. Drawn to antiquity and classical literature, he was strongly influenced by his tutor, Guarino da Verona, an early student of Greek. When Lionello determined to create a studiolo, it was Guarino who helped devise its decoration devoted to the Muses. Perhaps it was this antiquarian interest that prompted Lionello to commission several portrait medals from Pisanello. According to contemporary accounts more than 10,000 were cast, helping popularize this new form. Portrait medals were widely exchanged in court and humanist circles. They were given as tokens and presented as diplomatic gifts. Inside scholars’ studies they were discussed and admired along with collections of antiquities. Ancient coins must have provided an important model for these medals. Their inscriptions and imagery are often classically inspired, and some patrons had themselves depicted in Roman guise. The date of the first medal and the location of its manufacture remain under debate. 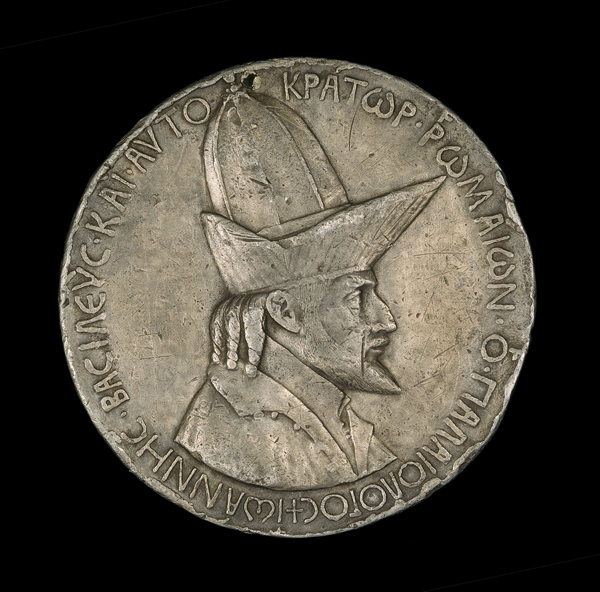 A strong contender for the earliest medal is one produced by Pisanello to commemorate the mission of John Palaeologus to Italy in 1438 and 1439. Hosted in Ferrara, the Byzantine emperor had come seeking Italian assistance against the Ottomans. His medal may have been cast in Ferrara, but because the plague drove the delegates to Florence, it may have been made there instead.